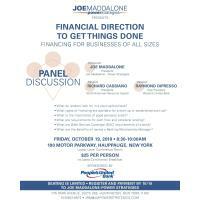 Join Panelists Richard Cassiano, President of North American Resource Capital and Raymond Dipresso, Vice President of People's United Bank, and Moderator Joe Maddalone, President of Joe Maddalone-Power Strategies, for a discussion about financing for businesses of all sizes. What do lenders look for in a start-up business? What types of financing are available for a start-up or established start-up? What is the importance of good personal credit? What are Debt Service Coverage (DSC) requirements of a bank? What are the benefits of having a Banking Relationship Manager? $25.00 Per Person, Includes continental breakfast!